Warm, clear Friday nights provide ideal stargazing conditions, as well as a variety of programs and talks by college staff at the planetarium. Viewers can enjoy ‘The Sky Tonight’ and one of the four full-dome films currently in rotation, plus views of the night sky through Palomar’s telescopes. 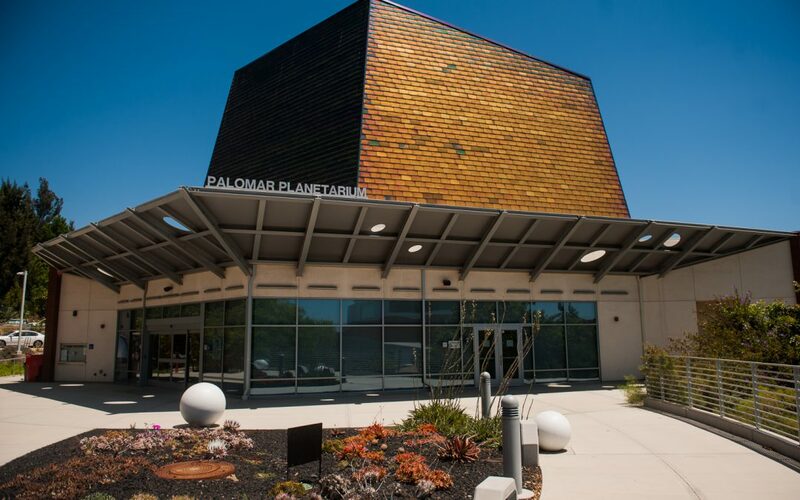 SAN MARCOS — As summer gets under way at Palomar College, Scott Kardel and the staff of the college planetarium are reminding local residents that even though the class loads are lighter during the summer, Friday night astronomy is still going strong. Presented live by a Palomar College faculty or staff member, The Sky Tonight runs from 7 – 8 p.m. and walks viewers through the stars and constellations visible on any given night, said Kardel. Between the first and second shows, visitors have time to peruse the gift shop or look through the telescopes that the planetarium staff set up on the patio by the box office. Each of the two shows costs $6 for full-price admission, with discounts for college students, staff, children, seniors and military members. There is no cost to look through the telescopes. Free parking is available in Lot 5, directly across from the planetarium on Comet Circle. For more information about the Palomar College Planetarium, please click here.